Spot bioluminescent fireflies, stay in alpine tents pitched at a beautiful campsite and escape into the forests of the Western Ghats. On this fireflies camping trip in Bhandardara, you’ll trek through dense wilderness to explore the trees, shrubs and bushes of the Western Ghats. En route, you’ll spot several bright, yellow fireflies that nestle in the monsoon-fed forests of Bhandardara. A sight to behold, especially in the darkness of the night, these twinkling fireflies will adorn your trail through dense forests. 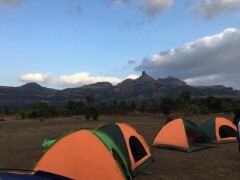 Another highlight of the trip, you’ll come back from an exhilarating trek and drift into sleep inside alpine tents pitched in the rugged mountains of countryside Maharashtra. Bhandardara, located in close proximity to Mumbai and Nashik, is a popular camping destination due to the waterfront of Lake Arthur and towering trees of the Kalsubai Wildlife Sanctuary. 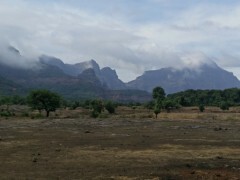 Your campsite on this trip will be located just outside the nearby village of Samrad, on the hilly slopes of the Western Ghats. The thick jungles that cover these hill slopes are home to thousands of fireflies that attract nature lovers from all over the state. 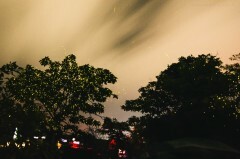 • Spot the glowing fireflies on a camping trip to Bhandardara. • Stay in alpine tents pitched at a picturesque campsite. • Make a quick getaway from the city life into the lap of nature. Travellers are required to adhere to the instructions of the tour guide during the fireflies camping in Bhandardara. Consumption of alcohol, drugs, tobacco products and cigarettes is strictly prohibited while camping. For cancellations made 10 days or more before departure of the Bhandardara fireflies camping trip: 75% refund. For cancellations made 5-10 days before departure of the Bhandardara fireflies camping trip: 50% will be refund. For cancellations made 0-5 days before departure of the Bhandardara fireflies camping trip: No refund. Travellers are requested to board the second last compartment from the Kasara side of the 10:20 hrs fast train from CST. Travellers are requested to be punctual. Travellers that miss the pick-up due to tardiness will not be eligible for a refund. In case weather forecasts predict rain during the day of camping, travellers will be accommodated in homestay at Samrad village. 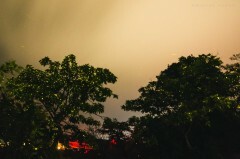 The tour operator reserves the right to cancel or alter the itinerary of the fireflies camping in Bhandardara to maximize the safety of travellers as well as staff. Travellers will be required bear any additional costs arising due to unforeseen circumstances such as bad weather, road blocks etc. 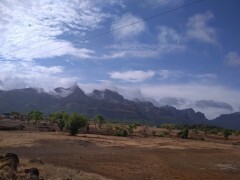 Arrive at the Kasara railway station by 12:30 hrs. From Mumbai, you can board the 10:20 hrs fast train from CST to Kasara. En route, you can meet your fellow campers by boarding the second last compartment of the train from Kasara. At Kasara, you'll travel to the base village of Samrad via shared, local transport vehicles. En route, the group will stop at a local restaurant or eatery, where you can have lunch at an additional cost. You'll reach your campsite at Samrad by afternoon and have fun with camp activities. As the sun sets over the horizon in the evening, you'll head out for a short trek in the forests to spot twinkling dim fireflies in the trees and shrubs. By night, you'll return back to the campsite. Overnight at Bhandardara in tents. Bright, yellow fireflies decorating trees. Wake up early morning to the peace and quiet of nature. Today, you'll descend back from the campsite to Kasara via shared vehicles. By 11:00 hrs, you'll reach Kasara railway station, where you can board a train back to Mumbai. Your trip ends here. Personal expenses such as tips to staff, additional meals or beverages etc. Overnight at Bhandardara in tents. Today's meal package includes breakfast before departure to Kasara. You'll arrive at the Kasara railway station by 11:00 hrs. Your trip ends here. Kasara railway station is connected to the Mumbai suburban railway system. You can board a local train from any of the railway stations in Mumbai and travel to Kasara. A fast train to Kasara leaves CST railway station at 10:20 hrs. Your operator will arrange your transport to the start point of the trek.